Numerous people are longing to learn of anything that melts off fat and unwanted pounds after eating junk food and unhealthy snacks. Two top infomercials talk about burning off the extra weight. How do they measure up against the things we understand to be honest about weight loss? Does it really involve less calories and more physical activity? Perfect Push Ups Review – This company did the correct thing by making improvements on what is know to be successful: the push up. The basic push up exercises all major muscle groups while at the same time exercising the interior walls and muscles. Push ups only need a little space so they can be done most anyplace. Perfect push ups adds a hand grip that you hold to as you do the push ups. You are able to do twisting motions that help build better muscle tone. The hand grip sells for $39.95 and it is a durable product. 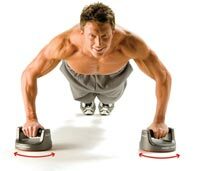 If you use Perfect Push up on a regular basis along with your normal workout, you will firm muscles and burn more fat. Many like the hand grip and call it a useful addition to their normal resistance training. Melt It Off Workout is a complete package in an exercise plan. Gold medalist Mitch Gaylord created Melt it Off that consists of recipes, exercise DVD, meal planning guide, G-ball, and one month of the suggested fat burner. It applies the concept we already know of getting rid of excess calories to lose weight and melt fat but drops the bomb from that point on. Melt It Off promises a refund if after 30 days you aren’t completely delighted with the package. The only flaw is that you don’t get your package sometimes until two weeks into the 30 day warranty ad refund payments are known to be postponed. There is nothing different concerning weight loss an burning fat and it has a flawed return policy. Melt It Off can be expensive at the original price and additional DVDs cost about $20. Customers would be better off planning their own diet, exercising at least 30 minutes in the afternoon, and write own the foods they eat in a journal. Don’t spend the money on this program.